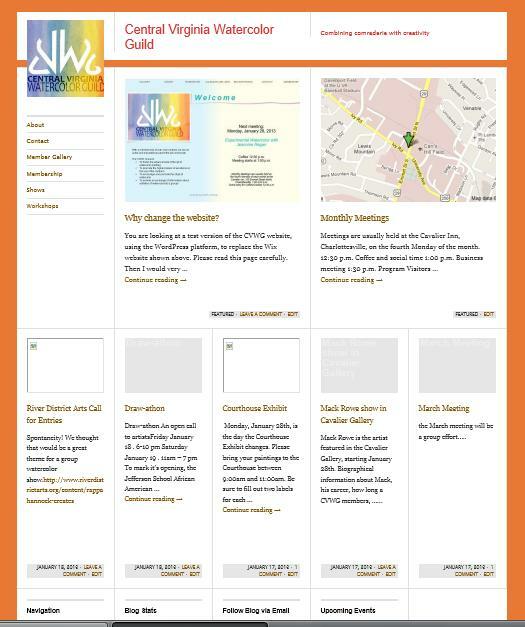 Welcome to CVWG’s New Website! You are logged onto the new version of the Central Virginia Watercolor Guild’s website. The old site used “Adobe Flash” technology, and could not be viewed on newer devices such the iPad. The main difference between the two sites is the HOME page which is now a Blog! You can always return to the HOME page by clicking on our logo or name at the top of the screen. The HOME page features two large blog entries, and five smaller ones below. You will probably have to scroll down to see the full page. The two large blogs are “featured” items that don’t change often. The five smaller blogs below will automatically be replaced as new blogs are added. Old blogs are archived–but they’re easy to retrieve (see “Navigation”, very bottom left). If the blogs are too small to read , click on the picture, title or “Continue reading–>” and the blog will open in a full page. All the blog entries are indexed by category. The Blog Index is in the right-hand column. (Look right–>>>>) If you want to see all the blog entries for “Shows”, for example, just click on “Shows”. All the blog entries invite reader comments. The first time you comment you will be asked for your e-mail address and name. The webmaster will OK you and the comment will be posted. All your subsequent comments will appear immediately. As with all new technology, we may encounter some problems, and we welcome reaction from our readers. For example, the pop-up advertisements may be annoying; blog text may be too small; not enough pictures, etc..
You can enter a comment about the website below, or send a private message to the webmaster by clicking on the “Contact” menu and filling out the contact form. Either way, let us have your feedback! This entry was posted on Jan 20, 2013 by miatomaine in Administration.